CADRE's work this year is largely focused on dissemination, and we are pleased to send you this quarterly CADRE newsletter that highlights efforts and resources related to that focus. We will disseminate information about your projects, both within the DR K-12 community and beyond; increase dissemination of CADRE resources, customizing, if necessary, for specific audiences; and, we hope to share dissemination strategies with those of you who are finding it challenging to "get out" your research findings, models, and new technologies. 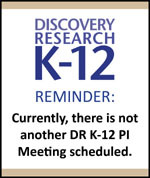 There are many active DR K-12 projects, and they represent great diversity. To learn more about them, visit the search engine on the cadrek12.org website. Not only can you review abstracts on these projects, but you can also learn about upcoming presentations and articles by PIs. Feel free to check bios of the PIs if you are interested in identifying advisors, consultants, or new colleagues. Because of the community's interest in formative assessment, we include in this newsletter an index of DR K-12 projects that have this focus. We are currently at work on a synthesis of engineering projects, as well as gaming projects. All three are being co-developed by the CADRE team and PIs. A highlight last fall was an orientation meeting for our ten CADRE Fellows. Since that time, CADRE organized two Fellows'webinars exploring the publishing world with guidance from Jorge Solis and Jamal Abedi. Next month CADRE will hold another Fellows' webinar with a focus on career pathways, and CADRE community members Jason Chen (College of William and Mary), Suzanne Wilson (Michigan State University), and Jakita Thomas (Spelman College), are likely to be sharing their experience and wisdom. If you want to share information about your projects on the CADRE website, Facebook or Twitter, please contact CADRE@edc.org and we will see what is possible. Review the Baltimore agenda, where slides, handouts, and other resources will be posted following the event. Visit successfulstemeducation.org for additional resources and information on past and upcoming events. In the latest in our series of project spotlights, we invite you to explore the range of DR K-12 work on formative assessment. With support from the Formative Assessment Work Group, CADRE staff have developed an inventory of projects doing research and development in this area. Of the 50 projects included, some focus explicitly and centrally on formative assessment R&D, while others include formative assessment as a part of a broader scope of work. The collection also includes projects producing frameworks and learning progressions intended to inform the development of formative assessment. For each project, the inventory provides information about content area, grade levels, assessment methods, and products. Access the spotlight and inventory. If you have questions about the inventory or the Formative Assessment Work Group, contact Derek Riley. The key word is ABSTRACT. Before embarking on a major article, submit a short abstract (80-120 words) to a journal editor of your choice and ask for FEEDBACK. You are likely to receive a quick repsonse. To decide where to submit an abstract (and ultimately an article), in addition to talking with colleagues, try Cabell's Directories (requires an institutional membership); CADRE's list of STEM publications; and/or go to the website of the journals that seem to align most closely with your areas of interest. Think about turning conference presentations into articles for publication. If you are part of a research group interested in a similar theme, consider approaching a journal with a special issue proposal. Planning to write an article or book chapter with a group? Talk about - and decide upon - authorship at the start! Don't wait too long; consider article publication possibilities at the same time you are writing your dissertation. If you haven't had an article published before, co-authorship is a good first step. Once you start writing, develop a realistic timetable with some way to make sure you can stay on task. Find time to write - set aside an hour each day to write and/or write with a group. This will help you focus and increase productivity. Future activities will focus on topics including career pathways and getting to know NSF. The Fellowship is designed to be a capacity-building experience for emerging researchers and developers in STEM education. Read an article from EDC's Newsroom on the Fellows kickoff meeting and supporting the next generation of STEM research. Learn more about the 2012-2013 Fellows and the CADRE Fellowship program. CADRE will be working this year to highlight the products and findings emerging from DR K-12 to both raise community awareness of resources that could be used by other projects, and celebrate the hard work that's gone into them. Two such products, which have been made available for use by other NSF grantees, are below. SmartGraphs is free, open source software that helps students understand graphs and concepts represented in graphs (e.g., slope, velocity, half-life, global warming). Activities run directly in a browser, so there is nothing to download or install. Concord Consortium is also making the authoring system available to any NSF-funded project that wants to incorporate Web-based SmartGraphs activities into its work. SmartGraphs Contest! The Concord Consortium is running a contest for teachers, educators, researchers and developers to create new SmartGraphs activities and compete to win one of several prizes. Activities can be submitted as storyboards or as software (created with the online authoring system). All entries due March 15. Learn more about SmartGraphs and submit your contest entry. Contact Andrew Zucker to gain access to the SmartGraphs authoring system. The Diagnosing Teachers' Multiplicative Reasoning (DTMR) project has created 2 assessments for middle school teachers. The first assessment is intended to measure aspects of multiplicative reasoning critical for multiplication and division of fractions; the second assessment is intended to measure core aspects of proportional reasoning. To date, the test on fractions has been calibrated using a large national sample. The project hopes to calibrate the proportional reasoning test by Summer 2013. Download the DTMR Attributes, which provide a description of the mathematical content of the two DTMR assessments for middle grades teachers. Contact Andrew Izsak for more information on DTMR assessments. If you would like to share a product from your own work, contact CADRE@edc.org. People turn to NSF to learn about the latest in research and development. Raise your profile with this audience by submitting a highlight to NSF. Approved highlights can be featured on NSF's website, Research.gov, Facebook, and Twitter (to name a few). Sending a highlight to NSF? We also encourage you to submit it to CADRE@edc.org for dissemination through our website, social media, and/or newsletter. 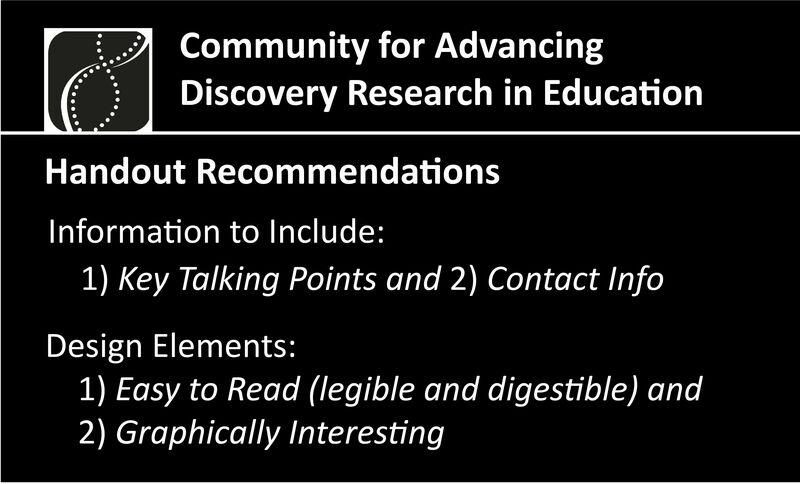 Review examples of NSF highlights. See guidelines for writing an effective highlight. REMINDER: Don't forget to fill out the NSF Multimedia Permission Form when submitting highlights. Create a "business card" that represents your project's work! This small handout can be doled out during poster sessions, presentations or casual networking conversations. It gives other attendees a take-away that includes key talking points, as well as contact information. Be sure to make the handout graphically interesting and easy to read. As ever evolving technologies become an increasing part of our professional and personal lives, CADRE felt a social media and technologies toolkit geared toward education research and development projects would be helpful. Whether your project is looking for free screencast or webinar options, you are interested in creating or enhancing your project's social media presence, or you just want to learn more about technology and education...this toolkit offers useful tips, blog recommendations, tools and apps for you and your project. Visit the Toolkit on cadrek12.org. Follow us on Facebook or Twitter to join our informal network. How many times have you done a Google search and actually made it to the 2nd or 3rd page of results? SEO, or Search Engine Optimization, is the process of optimizing a website so that it is ranked higher in search engine results on Google and Bing. This, along with analyzing how your site is being used and by whom, can help drive traffic to your project website(s). Finding out who is visiting your website. Google Analytics is easy to use, free, and can help you understand how people are using your website (number of visitors, pages visited, how they found your site, etc.). Researching keywords and phrases that you can optimize on your site. Online resources like the Google Keyword Tool can help with this process. Keywords and phrases added in titles, the body of the page, and in the image tag can really impact your site's SEO. Building links to and from other websites. As a start, tell CADRE about your project website or social media accounts! We are happy to link to these websites on cadrek12.org, as well as on the CADRE Facebook/Twitter pages. Want to learn more about SEO? Visit Breslyn Interactive. If your project does not have a website, increase your web presence by updating your project page on cadrek12.org! Thank you to everyone who filled out CADRE's survey on recent publications, upcoming presentations, and project websites. We've compiled the results in Excel files (available below) as well as on cadrek12.org: publications have been added as searchable resources; DR K-12 presenters have been listed on event pages in the calendar; and project websites are now listed on project pages. Find upcoming presentations by DR K-12 grantees. 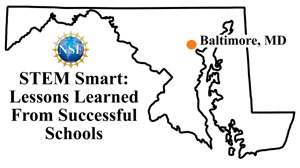 This month, NSF's Math and Science Partnership (MSP) program held their annual Learning Network Conference (LNC) in Washington, DC. The MSP community engaged in knowledge building and sharing around the theme - Implementation: From Vision to Impact. The meeting featured a general poster session, informal conversations, plenary presentations, concurrent awardee-led sessions, and interactive, featured-topic sessions that fell into three strands: 1) Lifecycle of Implementation; 2) Different Perspectives on Implementation; and 3) Evaluation, Research, and Implementation. Keep an eye on the LNC webpage, where you can review the agenda and access session papers, and where slides and recordings will be posted. The Department of Education's Office of Technology Education recently released a report, Expanding Evidence Approaches for Learning in a Digital World, which explores the potential of technology-enhanced learning environments as sources of data and evidence to improve learning resources and decision making at all levels (i.e., researchers, practitioners, policymakers). Access the report and share your feedback on evidenceframework.org.